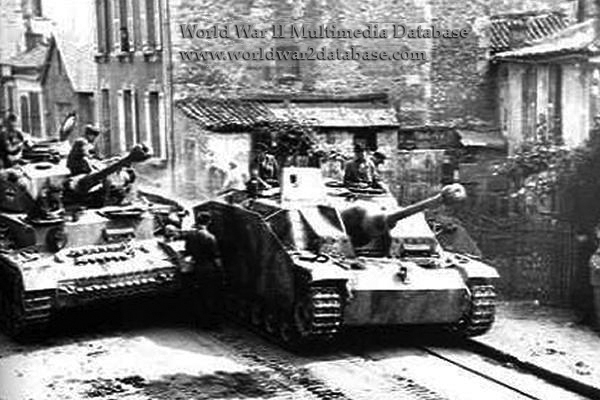 A Panzerkampfwagen IV ausf H (sdKfz 161/2) and a Sturmgeschutz III ausf G (SdKfz 142/1) stop in a French village. The ausf H was the most numerous version of the Panzer IV available in Normandy at the time of Operation Overlord. More than half of the available tanks in Normandy were Panzer IVs. 3775 Panzer IV ausf H were made between April 1943 and July 1944. The Sturmgeschutz (StuG) III ausf G was the most numerous variant built, with 7,893 built between December 1942 and the end of the war. This StuG III has a "Topfblende" (Cast Armor Aperture) gun mantlet, called "Saukopf" (Pig's Head) after the war, that was a one-piece solid cast steel armor that deflected anti-tank rounds better than the previous slanted box mantlet. The StuG III was designed to support infantry, engage enemy tanks, and reduce fortifications. Cheaper than most of the other German armored vehicles, it was the most numerous German armored fighting vehicle produced in World War II, with over 10,000 built of all variants.